"That's billion. With a 'B.' Now get me a sammich"
Activision Publishing Inc. announced today that Call of Duty: Black Ops has hit an astonishing one billion dollars in global sales. As you can probably guess, that breaks all sorts of records. 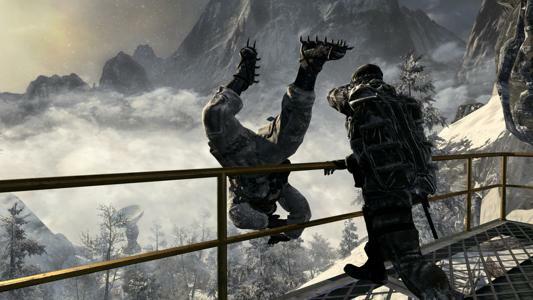 We reported last month, COD:BO sold $650 million in five days, breaking the previous five day sales record held by Call of Duty: Modern Warfare 2 by $100 million. Apparently, every gamer on the planet did not get a copy during those first five days. Activision also claims that 600 million hours have been logged in since the game launched on November 9th. The game has only been out for 42 days! That's only 1008 hours! How do 600 million hours go into 1008 hours? No one knows, because that kind of math doesn't even exist yet! That's some crazy number like 595238 hours per hour. Please, Activision, the next time you boggle my mind so hard, at least buy it dinner first. Do you know how much a billion dollars is? If you divided that up amongst Americans, each of us could buy a gallon of gas (If that gallon cost about $3.25, which here in California, it does). We could put that gallon of gas in our car, then go to the store, and buy a copy of Call of Duty: Black Ops. If you divided it equally into the world's population, that would be 14 and a half cents a person. That's a fortune in some countries! Four hundred and thirteen people could pool their money together and buy a copy of Call of Duty: Black Ops! What does this all mean for co-op? Hopefully it means that co-op friendly modes, such as Zombies and Combat training, are recognized as valuable assets to blockbuster titles. As for the campaign, we can only hope that they include co-op sooner rather than later. We'll see next November, since the Call of Duty franchise is now an annual release.